Scott Walker refuses to discuss evolution: There is no good reason to ask the Wisconsin governor about human creation. Even if he does answer, it won’t tell you anything. Wisconsin Gov. Scott Walker on Jan. 30, 2015. Someone needs to keep Republican presidential candidates out of London. Stateside, the reaction followed a familiar path. Liberals mocked the dodge, conservatives defended it, and both sides settled in for a nice afternoon of needless acrimony. I say needless because, of all the things to argue about, this is among the least important. 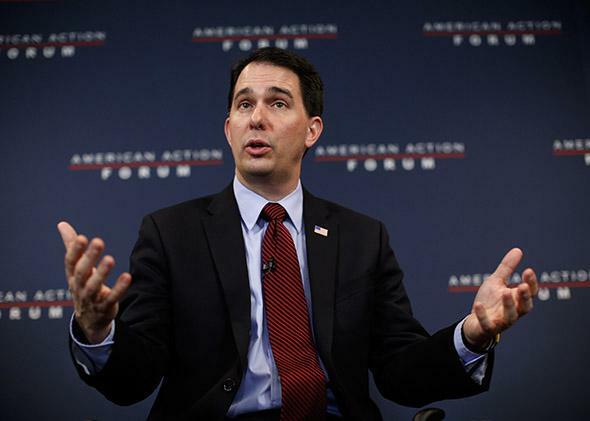 Who cares if Scott Walker believes in evolution? Why, exactly, does it matter? The easy answer is that evolution is a public policy issue. The foundation of modern microbiology and pathology, disbelief in evolution could lead to bad policy choices around disease control and other public health concerns. Likewise, evolution helps us understand biodiversity and helps us grasp what happens when we damage the stability of an ecosystem. Which is to say that a stance on evolution could also have consequences for environmental policy. And on the local level, what you think about evolution can matter for education policy: The standards you use, the textbooks you buy, and the school administrators you hire. Then again, there’s no need to ask about evolution if what you want to know are a politician’s views on disease control. All you have to do is ask about disease control. And that goes for the constellation of science-based issues. Want to know what Walker thinks about climate change? Ask him. Want to know if he thinks the government should do more to protect natural environments? Ask him that, too. The response to this is that “evolution” is a proxy issue; what you believe about the origins of life is a signpost for how you view science in the modern world. A politician who affirms the role of evolution in driving life, including humans, is presumably a politician who won’t hesitate to act on carbon emissions or fund important research. But there’s a problem. Views on evolution don’t actually tell you anything about how a politician will act or how he’ll approach science-based issues. Neither do they give any insight into public attitudes toward science. Take black Americans. In a recent survey from the Pew Research Center, 42 percent of blacks say humans have existed in their present form since the beginning, while just 55 percent say they evolved. But skepticism about evolution doesn’t translate to anti-science positions. To that point, 82 percent of blacks say the Earth is getting warmer, and 56 percent attribute it to human activity. Or take young people. Seventy-three percent of Americans age 18 to 29 accept evolution, but only 39 percent say it’s safe to eat genetically modified foods and 61 percent say scientists don’t have a clear understanding of genetically modified crops. The best example of this is the anti-vaccine movement, where young, educated, and evolution-believing parents refuse vaccines for their children, despite the direct connection between evolutionary science and the making and development of vaccines. If you want an actual heuristic for whether a given person is going to support science-based policy, your best bet is to ask their party affiliation. If he is a Democrat, then regardless of his views on evolution, he is likely to support action on climate change or want to strengthen environmental protections. And if she is a Republican, the opposite is probably true. Most black people vote for Democrats, and as a consequence they’re likely to have a Democratic take on climate change. And on the other side, most white Americans vote for Republicans, and believe accordingly: Only 44 percent blame human activity for global warming, in line with the general GOP position. There are a few scenarios where it makes sense to ask a politician about evolution. For someone who wants to shape school curriculums, those beliefs are vital. But even then, it’s difficult to draw a firm conclusion. A creationist school-board member might still want students to use mainstream science textbooks, regardless of her views on the question. Alternatively, there are times in national politics where evolution—as a matter of educational policy—hits the national stage. Then, it makes sense. But at this moment in American life, there’s no need for questions about evolution. They simply don’t tell you anything you couldn’t learn by asking a direct question about a specific issue. With that said, it is true that all of this is good fodder for the culture war. Or put differently, the only reason to ask about evolution is if you want to know something about someone’s cultural group. A view on evolution doesn’t say much about public policy, but it can mark you as a certain kind of religious believer or give you a chance to affirm your membership in one tribe or another. Which is to say that when a politician answers a question about evolution, they aren’t defending or rejecting science as much as they’re sending a message: I am one of you, and this is how you know.